Cadbury Christmas Mints are individually wrapped dark chocolate peppermint creams, with the addition of little crunchy mint pieces. Each 150g packet contains about 15. 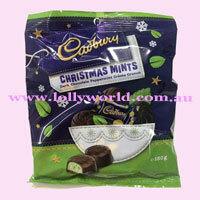 Cadbury Christmas Mints are individually wrapped dark chocolate peppermint creams. With the addition of little crunchy mint pieces, each 150g packet contains about 15.